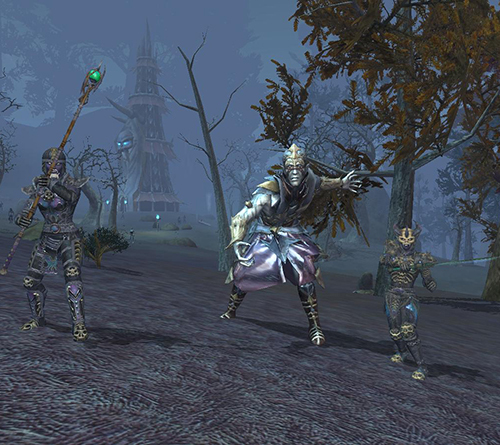 EQ2Wire » “Malicious Threat” Prelude Event is Now Live Until September 16th! “Malicious Threat” Prelude Event is Now Live Until September 16th! Early this morning, the “Malicious Threat” prelude event was activated on all EQ2 live (non-TLE) servers. This event will undoubtedly tie current events into this fall’s upcoming expansion, while giving some hints of what we can expect later this year. The prelude event was tested on the Test server and is now live until September 16, 2015. Good players can start the “Malice in the Glade” quest in Greater Faydark while Evil players should start the “Malice in the Woods” version in Darklight Wood. Both quests start in Greater Faydark. These quest writeups are by Sigrdrifa. When the quest is completed, you may continue defeating Primordial Malice mobs to get arcane Malice baubles which are a currency to buy special House and Appearance items. Niami Denmother of EQ2Traders has posted a Guide to the event and screenshots of all the in-game items which may be purchased. The mage house of Kelethin’s House of Falling Stars and Neriak’s Disciples of Innoruuk have both felt something disturbing a nearby location. They are looking for adventurers willing to investigate and help them uncover a threatening campaign being carried out. Players welcome in Neriak should speak with Virun D’Xyafin in Darklight Wood, while those that are welcome in Kelethin should speak with Miriel Tawnyglade in Greater Faydark. Error: evil players start in Darklight Woods just outside Neriak. Despite what Niamh says in her writeup, the baubles don’t drop from grey mobs once you’ve done the quest as they drop in a chest. Guess they changed that from beta. I’ve had to mentor down to hunt in lower level zones. And even when non-grey they don’t always seem to drop a bauble, which is frustrating. i have kill gray mobs on 8\13\15 and 8\14\15 and they drop the box’s need. But not always…..just keep killing them you will get what you want. Quick event, but fun for a prelude. Should be a great story line. Could see Enchanted Lands being hard for some to find with it not being included in the mapping, but hunting down locations based on clues has a big payoff for those who enjoy that treasure hunt feel. At 100, found no problem in hunting down Malice members in Tranquil Sea. Groups have a quick pop rate about 5 minutes, and set locations. With server populations as they are, we were the only ones there after the patch so had about 120 tokens in a couple hours. Charm is decent, no more so than Guise of the Coercer though. However the fact that its an item i’ll use for the rest of my game play makes it a great reward for a 30 minute prelude quest and light farming. Expansion in the Fall? Source? I heard nothing about it. And with the major slash in employees since earlier this year, how in gods name could they support it? If its about the same amount of content as The Fallen Dynasty at the price of an expansion, I will call it an overpriced adventure pack…. Well it could be worse….they could make something called, oh lets just call it Rum Cellar, sell it for 15 bucks then make 90% of it irrelevant less than two months later with free content. That could really happen! Yeah, I can’t ever use temp charms either. Either lack of discipline for swapping things or reasonable gut reaction to situational temporary gear being more trouble than it’s worth. A mounted head on a wall, tho’… That’s pretty straightforward. Will you confront malice in Norrath? Yes! And I have the bread tin to prove it!